Whether it’s a challenge we’ve faced first hand at Atomic Revenue, or a barrier to growth we’ve helped a client solve, our team has learned not only from experience but by being avid readers. We decided to put our heads together to come up with this list of reads that we consider to be game changers. 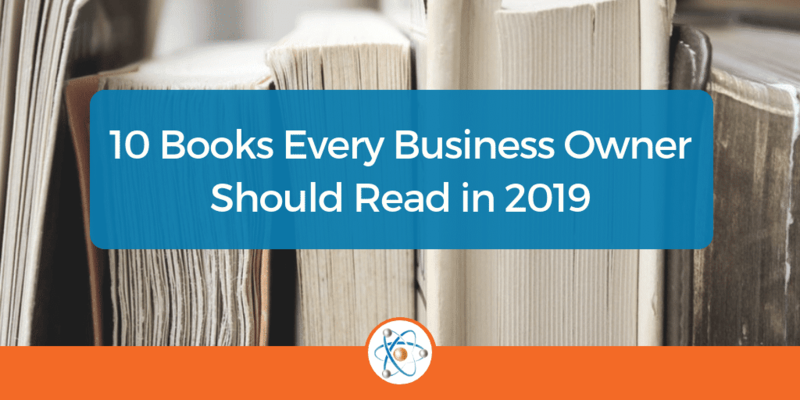 These are the 10 books every business owner should read this year. From body language to productivity, mindset to improved working environments, relationship building to accountability, there’s bound to be a book on this that will help you improve greatly as a business owner. Why we love it: When business meetings become wasted time due to lack of accountability, constant arguing, and blame games, it’s time to pick up this book. With the help of the Entrepreneurial Operating System® your leadership team will master a set of managerial tools to redirect your business on the path to success. Why we love it: It turns out treating employees like cogs in a machine instead of the creative, emotionally intelligent beings they are leads to a severely broken system. Who would have thought? Learn how to spark colossal change and immediately apply simple methods to implement a healthy working environment. Why we love it: As commander of the Joint Special Operations Task Force in 2004, General McChrystal explains how solving challenges faced overseas in Iraq can be applied to the business world. He emphasizes the importance of giving small groups freedom to experiment and share their discoveries across large organizations. This read is excellent for business owners struggling to scale their businesses effectively. Why we love it: Often too busy with data and analytics we forget the power of cultivating good relationships with our consumers. This page-turner looks beyond numbers-based analysis to explore the value of relationships in building the economy. Why we love it: This book remains a top business book for good reason – Dale’s advice actually works. If you haven’t read any of the books on this list, start with this one. Dale offers time-tested knowledge to help business owners utilize their skills to influence without causing resentment. Why we love it: We couldn’t round out this list without a great book about body language! Joe Navarro, an ex-FBI agent, teaches us the power of what our bodies are signaling to others and what theirs are communicating to us. Learn simple nonverbal cues to better understand your customers and colleagues. Why we love it: World-renowned Standford University psychologist Carol Dweck shares her discoveries on the ‘power of mindset’. She explains how all human endeavors are heavily influenced by how we frame them – with either a fixed or growth mindset. Learn how your mindset can change the realm of possibility for your business! Why we love it: Have you ever stopped to ask yourself the question of ‘why’? Why do companies like Amazon thrive while others struggle to stay in business? Simon explores why success is so hard to come by, why recreating that success is even more impossible, and how important it is to step back in your own business to ask the questions ‘why’? Why we love it: Smarter Faster Better is an incredibly fun and easy read dealing with the complexity of productivity and how we need to change from being ‘busy’ to legitimately productive. This intricately researched book delves into the actions of highly productive people and how they don’t just act – they view the world profoundly different. We hope there are a few titles in here to help take your business to the next level! We can’t stress the importance of picking up an actual book and reading cover to cover, especially with the many digital options and distractions currently available to us. Find some time in your schedule to sit down with one of these books every business owner should read and enjoy. What books are on your list this year?